In support of the first ever "Filipino Food Month", the Culinary Historians of the Philippines (CHOP), will dive deeper into the food and culture of its Moro brothers and sisters. 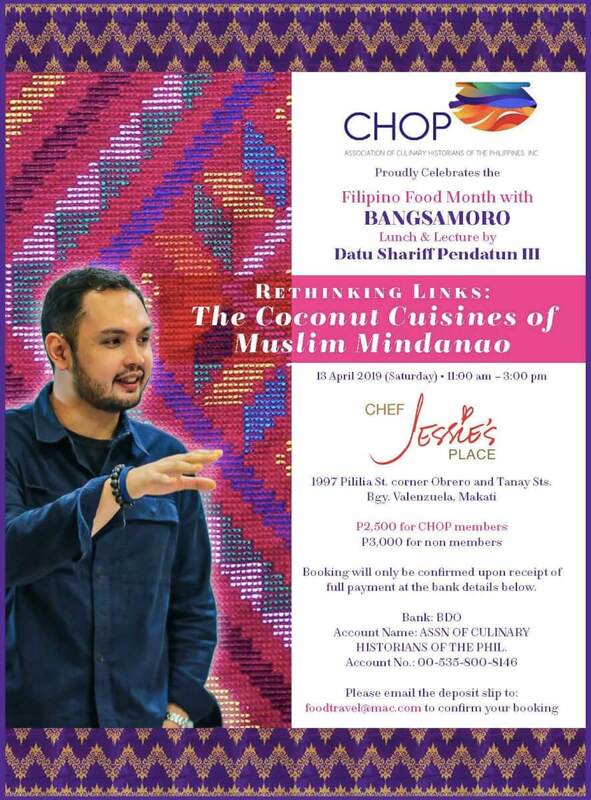 On April 13th (Saturday), 11am-3pm at Chef Jessie’s Place, CHOP will have a BANGSOMORO Lunch and Lecture by Datu Shariff Pendatun III, a corporate chef, a prolific writer, and a descendant of both the pre-Islamic rajahs of Buayan in Mindanao and of the Maguindanao’s first sultan, Shariff Muhammad Kabungsuwan—an Arab-Malay prince who brought Islam to Mindanao in the 15th century. CHOP honors Proclamation 469, declaring April of every year, as “Buwan ng Kalutong Pilipino” or “Filipino Food Month”. This year is a momentous event and CHOP is proud to be a part of history, and reinforce its manifesto to promote and preserve the history and heritage Philippine cuisine and culinary traditions. The package cost for BANGSAMORO Lunch and Lecture is P2,500 for CHOP members and P3,000 for non-members. It will be on 13 April 2019 (Saturday), 11am-3pm at Chef Jessie’s Place located at #1997 Pililia St. cor. Obrero and Tanay Sts., Brgy. Valenzuela, Makati City.